The Wilson Titanium mask as the standard profile frame shape and its lightweight puts in a category of its own. 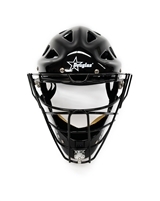 Smitty Hockey Style Face Mask By Douglas The Defender Mask is truly the next generation of umpire masks with virtually nothing coming close to the protection it provides. Available with tan or black pads. 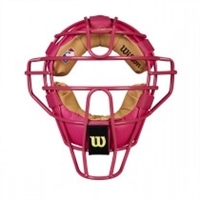 Get the same gear MLB umpires wear for Mother's Day with this limited edition Dyna-Lite Steel Pink Umpire Mask. 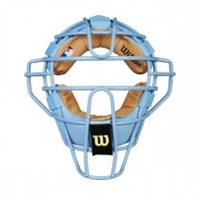 Get the same gear MLB umpires wear for Father's Day with this Dyna-Lite Steel Blue Umpire Mask. Diamond's popular Ultra-Lite aluminum alloy face mask now boasts full-grain leather pro-style pads. This very popular umpire mask is one of the lightest and most comfortable at this price point. Wilson Dyna-Lite West Vest Mask with two tone leather pads. This sturdy umpire mask is budget-friendly without skimping on protection. This Wilson Dyna-Lite mask has comfortable synthetic pads and is a great value coming out of the Dyna-Lite family of mask. 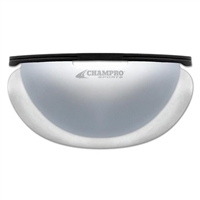 Champro light weight mask weighs only 18 oz. Made from lightweight steel, this throat guard was designed to fit and attach seamlessly to the Defender. Weighing a little over 3 ounces, the throat guard measures 3 3/8" wide and 5 3/8" long with the signature F3 logo built into the design, it's the perfect size to provide added protection. The body of the throat guard is curved to help prevent baseballs from sneaking up in between the throat guard and your throat. No throat guard can protect or guarantee total protection against those rogue baseballs. Padded throat guard for comfort and great protection is available in both 4" and 6" lengths. the area between mask and chest protector. Available in 4" and 6"